Sometimes an idea for a Code 3 model can stay with you for quite a while, until the right donor model comes along. 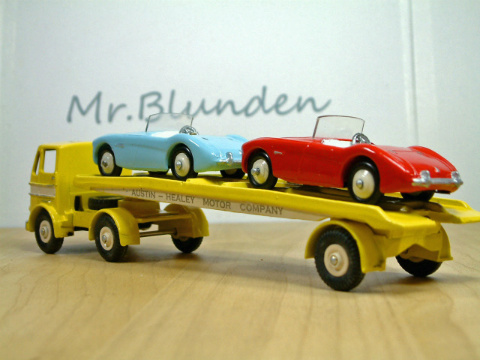 Such was the case, all be it loosely, with the Austin Healey Car Transporter in this article, which was based on this picture of an old Jensen Factory Transporter that I had had for some time. 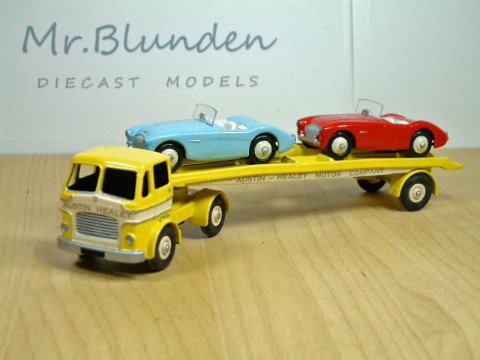 I actually went on to make two models, both are based on the same idea, one an Aston Martin transporter and this, possibly my favourite of the two, the afore mentioned Austin Healey transporter and load. This was where I started with the project. 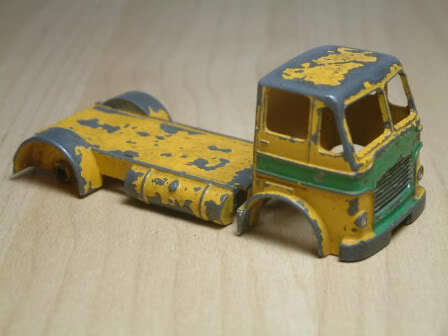 This is a Dinky Toys Leyland Octopus, well half of one that I picked up at a local toy fair. 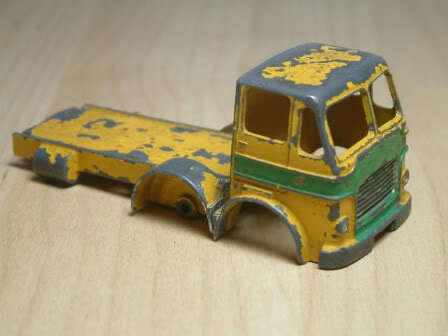 Dinky made many large, fixed axle trucks in the fifties and sixties, but never made any of them into articulated versions, and this half a model was my perfect excuse to have a go. The first job was to cut between the two front wheel arches, making sure not to damage either set. The rear of the cab was then turned around 180 degree’s, and the second axle wheel arches are filed down to form the rear of the new articulated ‘tractor’ cab. In this picture I was still thinking of other possibilities, and this size would have been good for a wrecker truck possibly, but still looked to big to be the front of an articulated unit and so was later cut again to shorten it. This is a while later. The cab has now been stripped of old paint and the two sections have been rejoined. This was accomplished useing a small solid steel bracket held initially with Power Bond, and then covered with a layer of two part adhesive. 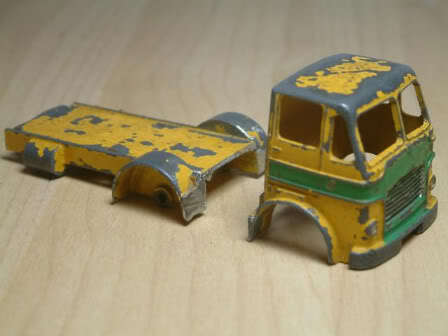 These pictures were taken as it was assembled for the first time, the towing hitch and spare wheel on the back were later swapped for a one piece item, adapted from the Dinky Bedford OB cab. 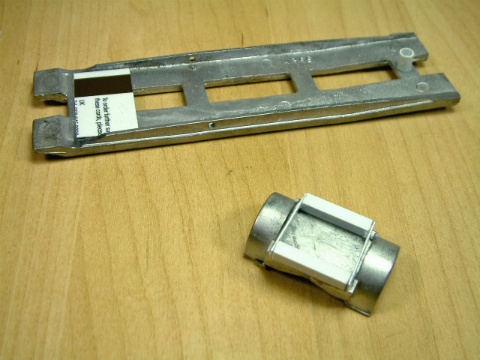 Here are the two main components of what will be the trailer. 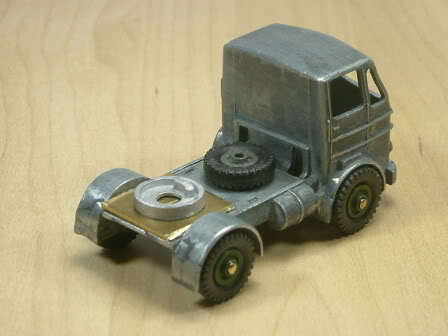 The bottom part of the picture is a white metal reproduction of the rear section of a Dinky Foden lorry. 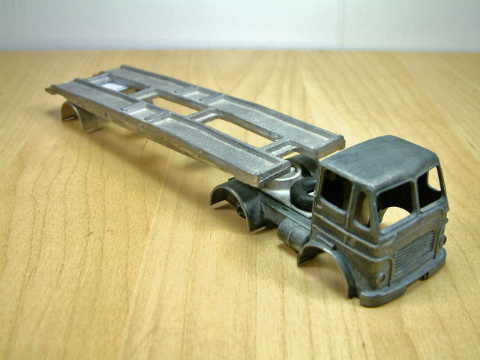 The top part of the picture is a white metal reproduction of the top deck of a Dinky 983 Car Transporter. Although this will be a ‘Code 3’ model and therefore could be made of pretty much anything, I thought it right to try and make as much of it as possible Dinky in origin. The top deck part of the trailer was augmented with a plastic section to seat the rear wheels, and a small piece of plastic tubing to act as the towing lug. As can be seen most of the bottom section was cut away, and the small base that was left was built up with plastic to give the deck a reasonable height when placed upon it. 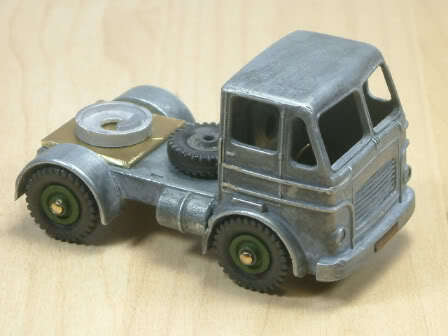 The other part of the bottom Foden wheel section not used on this model, went on to be used on the Aston Martin Transporter that was a near twin of this model. Best not to waste anything if at all possible. A chance at last to see how the model might look. This was the last picture I took of the model in development, after this I got a bit carried away with the build and so the rest of the pictures are of the finished article. Much after this though I think is self evident. The top deck had it’s front side lugs removed and the holes for the lifting arms filed, they would not be needed for this project. The cab build was fairly standard, the base though had to be fixed into place using the same two pack adhesive, as naturally the origional holes for the holding flaps were now out of place. 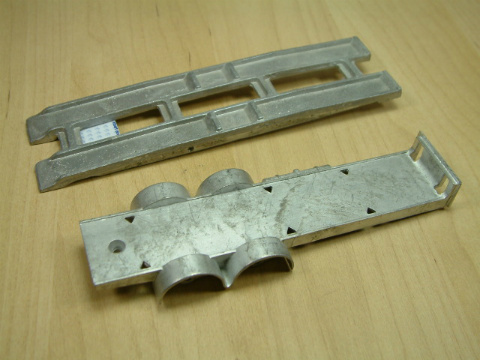 These were covered anyway by the articulated plate. The decals used were home made, using a simple word font, a standard photo ink jet printer and some special water-slide decal paper. 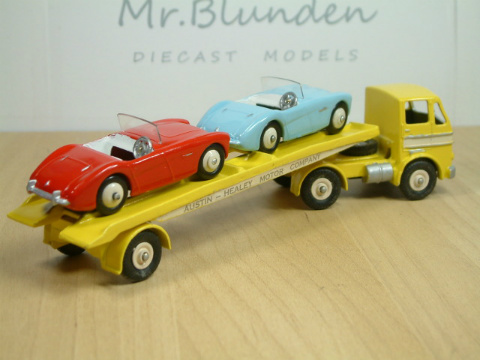 In keeping with it’s Dinky origins, I restored two Dinky Austin Healey cars to act as a load. Half the fun of a Code 3 model for me is to make something that ‘might’ have been, and I think in this case the finished model works very well. 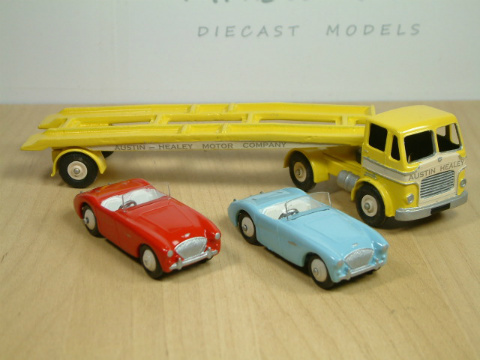 The Austin Healey Transporter with her Aston Martin ‘sister’ Code 3. 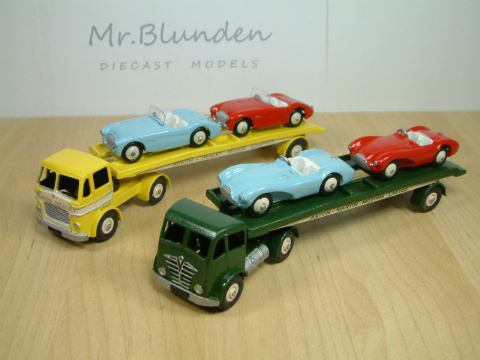 This entry was posted in From the workshop (Code 3) and tagged Austin Healey, British, code 3, Dinky, Dinky toys, Model, Transporter. Bookmark the permalink.